Vegan baking ain’t easy! 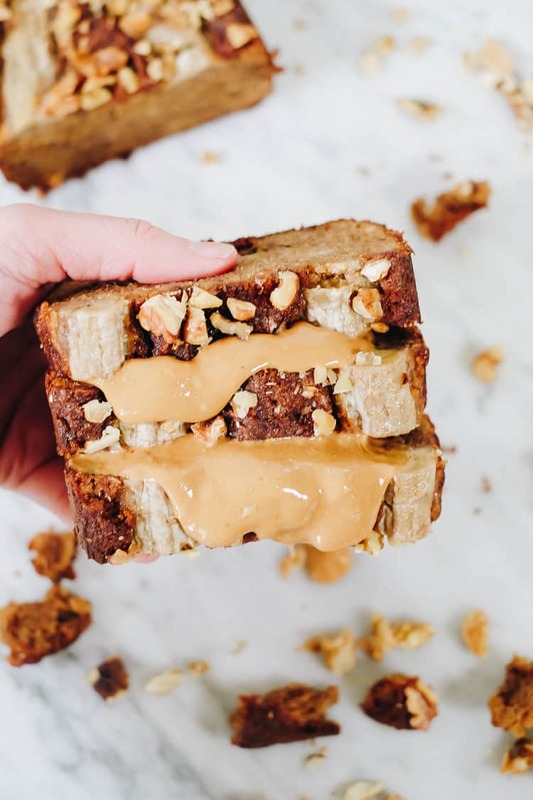 That is mostly all I have to say about that, but I am soooo happy to share this Paleo vegan banana bread with you! It is egg-free, dairy-free and refined sugar-free. Plus, it’s easy to make and nobody would even suspect it is Paleo and vegan friendly. It’s that good! I read years ago that a lot of people with Multiple Sclerosis (MS) have allergies and sensitivities to eggs. Well, I really like them and baking, so I decided to turn a deaf ear to that one. It is kind of comical that I say that because one of my primary symptoms of my MS is that I have permanent hearing loss in one of my ears (I’m not actually deaf – just have bad hearing in one ear – ask Justin he’ll tell you). It was sudden and happened shortly before my diagnosis – actually that hearing loss is really the reason I came to get my diagnosis, but that’s another story. I’ve digressed, so when I say I turned a deaf ear to the idea of eggs maybe not being the best option for me…well, I must have turned to the left (my right ear is the bad one)! But it kind of always stuck with me and lingered in the back of my mind. So…I recently decided to ditch eggs and see how I feel. I think the answer is that I feel better without them. It’s sad and good all at the same time. 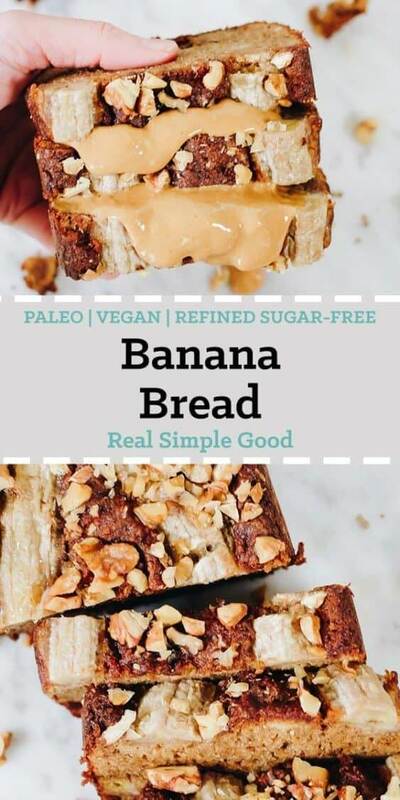 Making this Paleo Vegan Banana Bread was a must for me. 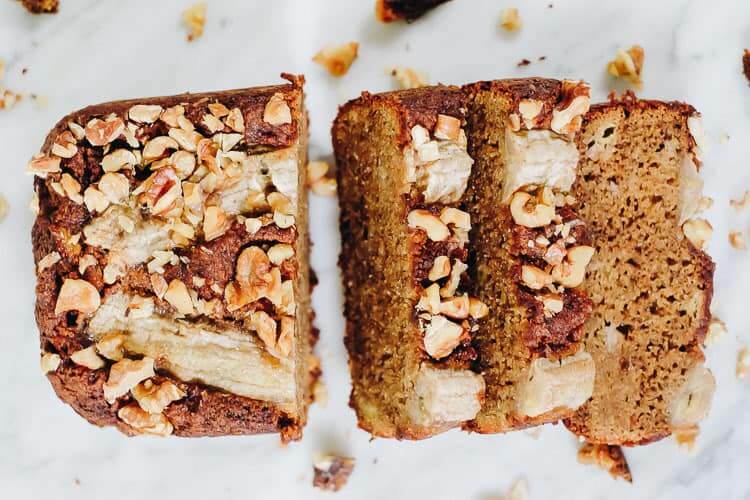 I just needed a slice of comfort food and that is exactly what banana bread is for me. I really did work on this Paleo vegan banana bread quite a bit longer than it usually takes me to “get it right”. I think you’re really going to like it though! 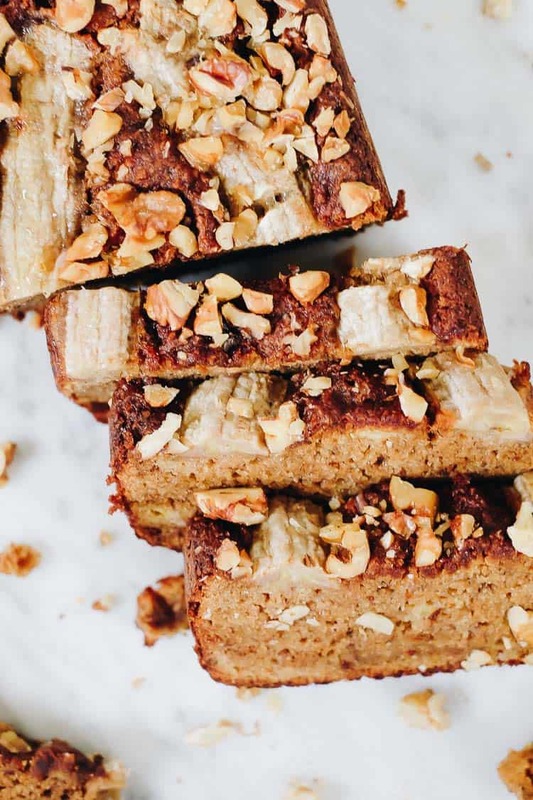 The outer edges get that almost crispy, but kind of chewy texture, where the inside is like regular banana bread texture but slightly more gooey. It’s actually become a new favorite and something Justin and I go through pretty quick when it’s sitting on the counter! Justin is not typically much of a muffin/bread person, so when he enjoys something I know it has the golden stamp of approval! And you can really do whatever you want for the toppings, or no toppings at all to make it your own. We just happen to like adding some extra banana and walnuts sometimes. Other times chocolate chips! And of course, the obligatory nut butter drizzle! 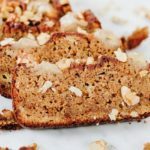 Whether you are not eating eggs or just want a baked good, give this Paleo vegan banana bread a try! 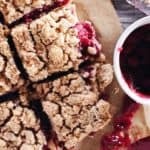 It is really easy to make and nobody would even suspect it is Paleo and Vegan friendly. Let us know how it goes by leaving a comment below. Also, take a photo and tag us on Instagram @realsimplegood, so we can check it out! Vegan baking ain't easy! 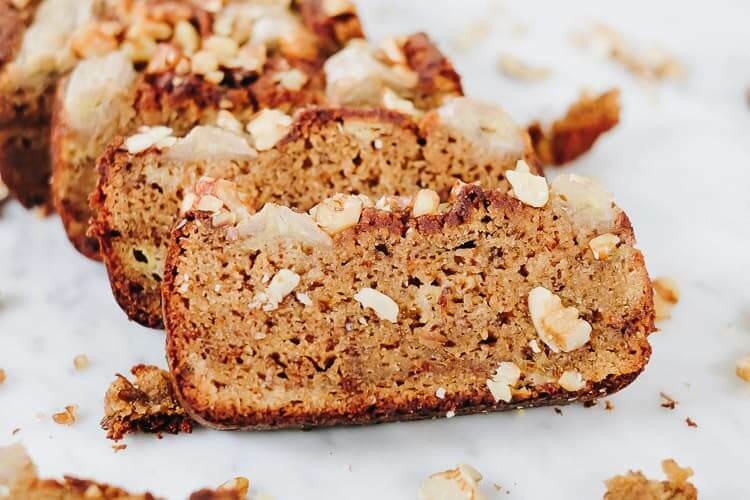 That is mostly all I have to say about that, but I am soooo happy to share this Paleo Vegan Banana Bread with you! It is egg-free, dairy-free and refined sugar-free. Plus, it's easy to make and nobody would even suspect it is Paleo and Vegan friendly. It's that good! Preheat oven to 350° Fahrenheit, and line a standard bread loaf pan with parchment paper. In a large mixing bowl, mash up the banana. Add the coconut sugar and vanilla. Stir to thoroughly combine all of the ingredients. Add almond flour, tapioca starch and sea salt. Stir to combine. Add baking soda and apple cider vinegar. Let them react and then mix in. Spoon the batter into the lined bread pan, and spread out until it is evenly dispersed. Add toppings and gently press them into the batter. Transfer to oven and bake for 60-65 minutes, or until the top turns brown, cracks and the loaf is firm. Once done, use parchment paper to lift the loaf out of the pan and cool. Slice and serve! Store in an airtight container on the counter or in the fridge to keep it fresh longer. I was so excited to see this recipe , especially for my son who cannot have dairy or eggs. BUT , he cannot have any type of nuts, and I see you have almond flour. 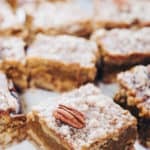 Is there a way to substitute almond flour for something else? Good idea! Thanks for sharing Stephanie! Let us know how it goes if you give it a try, Heather! 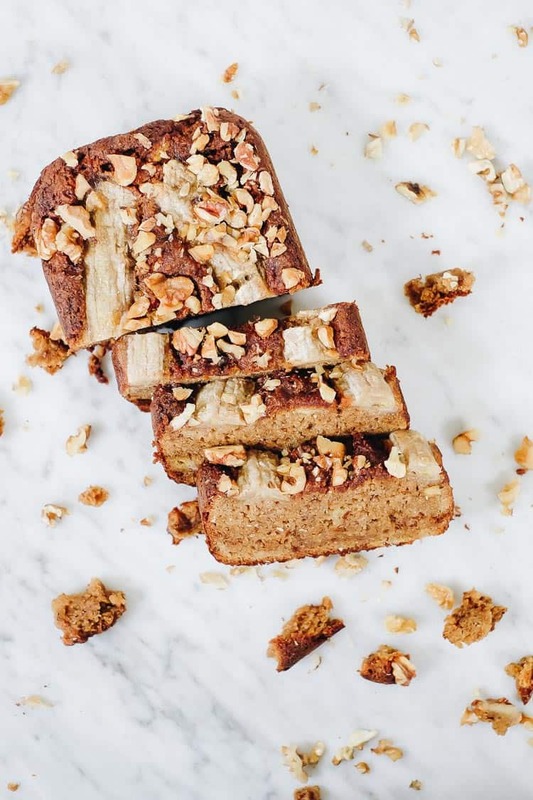 This is the best banana bread I’ve ever had! I just baked it and can’t stop eating it, and I’m not normally a huge fan! But I needed to use up frozen, very ripe bananas so looked for an eggless, paleo recipe. I doubled the number of bananas because they were so shriveled as well as added a fresh, ripe one. I also threw in about a 1/3 cup chocolate chips and 1/3 cup pecans. YUM! Did you cook this in a metal bread pan, or a stoneware? I used stoneware and after 70 minutes(I give a few extra to let the thicker pan heat up) the top was dark brown and although the loaf felt solid, it was still a little too doughy in the lower half ? it’s not like I have any food safety concerns because of the lack of egg, but texture wasn’t quite what I wanted… I toasted the slices on a pan on low temp, so I think it will be okay, but I’d like to know what type of bread pan you used! 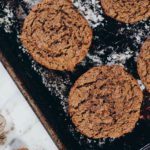 It smells divine, and the flavor is great… and after the slice is crisped in a pan, it kind of reminds me of bread pudding with a crispy outside. It just isn’t really giving me “bread” texture. Oh good! Hope you find some yummy ways to bake using that recipe as a starting place. You might also look at our recipe for these blueberry muffins. They’re also egg-free! We just posted the recipe recently! Keep us posted! Upon further testing, a metal muffin tray is giving me the best results…. although the bread is coming out substantially darker than the pictures you have (google search black banana bread, and that’s what mine looks like!) but the texture and flavor are bread, so no complaints here! Great recipe! I’m so excited to try this recipe! I just started an elimination diet and have been missing muffins/breads etc terribly. 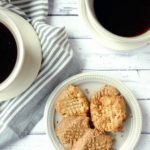 I was wondering if this recipe would still work ok without the coconut sugar? The diet I am following restricts any sort of sugar, even natural sweeteners such as honey/maple syrup/ coconut sugar – and I’m just wondering if omitting the coconut sugar will change the consistency of the bread. I had the exact same question! I did was was suggested and added ~2 tablespoons of coconut flour (I ran out of almond). The bread turned out delicious, although it didn’t seem to fluff up as much as in the pictures above. 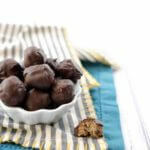 Thank-you so much for this recipe, my son has Autism and has shown to have many food allergies. This recipe fit his diet felt like a treat, and made me so happy I could get him to eat something healthy. I think you misread the point of the blog post, but thanks for the feedback and we hope you have a great day. Hello this banana bread looks delicious! 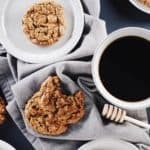 Would I be able to replace the coconut sugar with honey and if so how much would you recommend? Hey there – I haven’t tried it, so I can’t say how much or how the consistency would work out. I personally prefer coconut sugar because it has a lower glycemic index. If I were going to try though, I’d probably start by trying 1/4 cup honey. Again, can’t say how it would work out though. You’ll have to let us know if it works if you give it a try! Glad you enjoyed it! Thanks for giving our recipe a try! I have not been able to find a good banana bread recipe since going grain free, dairy free, and egg free a couple years ago. Decided to give your recipe a go and so glad I did! Truly wonderful! Thanks for the amazing recipe!! My boyfriend is on a restricted diet for a few months and I just wanted to say thank you for this delicious recipe. I made them for his birthday(there are few baking recipes he can have) and no one could believe how little they had in them. Thanks so much!